LOS ANGELES — He started his engineering career in the Republic of Korea commissioned as a 2nd Lt. in the ROK Marines in 1962. He even did a stint in the U.S. Army assigned to the U.S. Army Corps of Engineers, Far East District from 1975-78 and started his civil service career there in 1978 as an advanced intern. 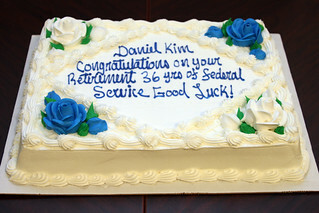 In more than 36 years of federal service, Daniel Kim spent 21 years with the Corps, the last 6 with the Los Angeles District and 15 years in various federal service assignments. “I feel it is my honor and privilege to serve our great nation and especially the great team here,” said Kim. Like the District motto “Building Strong and Taking Care of People” Kim’s work did just that. To his credit are numerous military construction projects that improved quality of life for service members in Korea, Calif. and Nevada. The Garden Grove ARC, a $21.5 million project, included the demolition of existing facilities, construction of a two-story 63,000 square foot building and a separate 24,000 square foot storage facility. “The objective of my mission is to deliver a quality/complete and usable facility to our client conforming to the contract and within the scheduled time and the allocated resources,” Kim added. About half way through the ceremony Kim made reference to wishing he had brought his pickup truck as Toy presented him with the Commander's Award for Civilian Service; a shadowboxed Certificate of Retirement; a Certificate of Appreciation on Retirement; a retirement plaque; retirement pin; 35-year service pin; Commander's Letter on Retirement; and Division Chief Letter on Retirement representing the fruits of his labor. “I think my wife, Jane, is worried about me being home and inventorying the refrigerator three times a day,” said Kim. By all indications, visiting two adult children on the east coast, Kim doesn’t plan on too much house duty, after he hangs all the hardware presented to him that is.